All Slots Casino is already one of the top gaming destinations to found on the Web, with a complete collection of games that are powered by the online casino software, Microgaming. And now they have added a new, powerful, exciting component to the mix. All Slots has introduced live dealer casinos for its customers; a feature that totally changes the player experience that has heretofore not been felt by he online casino gaming enthusiast. To put it succinctly, anyone who is looking for the ideal way to integrate the convenience of playing in an online casino with the thrills and atmosphere of a physical casino will find a home within the live dealer casino. How it works is quite fascinating. The player will log onto the online casino and click the appropriate tabs to go to the live casino. The connection is made through a live video feed, and that feed allows the player to take part in the games in real time. The dealers, many of whom are attractive females, greet the new players by name, and the software that is involved allows for a live chat to take place between the player and the dealer, or the player and other players who are involved at the same time. There are three games that are available to be played in the All Slots live dealer casino. These are live blackjack, live roulette and live baccarat. You are literally able to watch the dealer in the process of administering the games, and there is the opportunity to see the results of whatever is happening appear right there on your computer screen. So how does this happen? Well, in blackjack, for example, the cards are equipped with a code that is embedded in them. This code indicates which card it is, and there is a sensor in the show that reads the code. In real time, it is identified and posted in the screens of all the players who are participating. Basically, everything happens the way it would in a "real" casino. You are literally transformed into a brick and mortar environment, because the dealers and the tables are located in a room that resembles a real-world casino. You can even talk to the other players, the same way as you could in a "real" casino. There are a few differences, of course. One is that you don't have to deal with the second-hand smoke like you might in a brick and mortar establishment, and guess what - you don't have to dress up for this night at the casino. You see, you may be able to see them, but they can't see YOU! 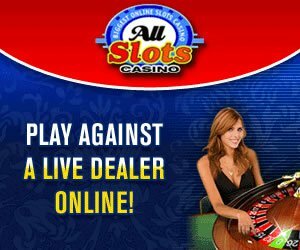 What you're going to find at All Slots Casino is a live dealer casino experience that is positively addictive. And it accommodates big action as well; one of the things casinos that have used the live dealer format have found is that they do attract people who are betting more money. Yes, that is a caution - you can't come to the live dealer casino to bet pennies. But the thrills will be well worth it, as you can imagine!